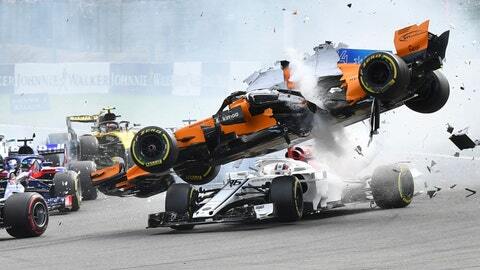 SPA-FRANCORCHAMPS, Belgium (AP) — Fernando Alonso’s McLaren car spiraled into the air and bounced — yes, bounced — on top of Charles Leclerc’s Sauber during a dramatic first-lap crash at Sunday’s Belgian Grand Prix. Both Formula One drivers walked away unscathed, with the “halo” protective device surrounding Leclerc’s cockpit appearing to save him from a serious head injury. The FIA has been looking at ways to improve cockpit protection and limit the risk of head injuries, after French F1 driver Jules Bianchi — who was a close friend of Leclerc’s — died in July 2015 and British IndyCar driver Justin Wilson died a month later. In Sunday’s crash, Leclerc’s head would most likely have been hit, if not for the halo. “(Alonso’s car) would probably have made contact with his head,” Whiting said. Wickens’ car flew into a fence and darted back toward the exposed head of another driver, Ryan Hunter-Reay — who ducked down and escaped unharmed. Video footage from Hunter-Reay’s in-car camera provided a terrifying glimpse at just how close Wickens’ car came to striking Hunter-Reay’s head in what would have almost surely been a fatal blow. “We are talking to them,” he said. Alonso, who was sent airborne by Nico Hulkenberg’s Renault ploughing into the back of his car, was thankful no one was harmed. The halo forms a semi-circular barrier around the driver’s helmet in the front half of the cockpit, protecting the head without completely closing the cockpit. When first tested ahead of 2016, drivers were split as to whether they liked it with some — such as four-time F1 champion Lewis Hamilton — criticizing it on aesthetic grounds. Bianchi’s accident at Suzuka occurred at the end of the race in rainy, gloomy conditions, when his Marussia team car slid off the track and ploughed into a crane picking up the Sauber of German driver Adrian Sutil, who had crashed at the same spot one lap earlier.